What should I do before going to the gym? Before you turn up at the gym you should make sure that you've had plenty to drink, and also something light to eat half an hour before you plan to start your workout. Top Tip! Definitely avoid eating a heavy meal within a couple of hours of working out. The main concern when working out at the gym is that you're safe and comfortable - not fashionable! Make sure you're wearing clothes which allow you to move easily. You should also invest in a good pair of supportive trainers for your feet. For ladies, a well-fitting sports bra is also a good idea, especially if you use the treadmill or do aerobics. Top Tip! 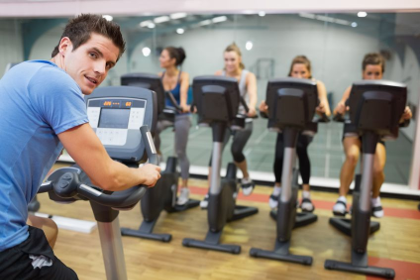 If you are concerned about sweating in the gym, wear dark clothes and avoid vests or singlets. A drink is always a good idea - however, any good gym will have water fountains and will also sell a range of drinks. A small towel is also a good thing to bring - so you can wipe down the equipment after use. What should I look for in a gym? If you're new to the gym, rather than considering things such as the range of equipment on offer, the most important thing to look out for is the attitude of the staff; they should be friendly, helpful and approachable. If at any time you require assistance they should be on-hand and happy to help. What happens when I join a gym? Any good gym will offer you a full induction when you join up. This can take anywhere up to an hour, and its purpose is to familiarise you with all the equipment and show you how you should structure a workout session. After the induction you should be offered a fitness programme, which will be personalised to your current level of fitness and your particular goals, be they weight loss, muscle gain, regaining fitness after pregnancy or illness, or anything else you're looking to achieve from your time in the gym. Top Tip! Any good gym will offer to review and update your fitness programme from time-to-time. This is important as your fitness level progresses, so make sure you don't miss out. How should I behave in the gym? The short answer is: with courtesy to other gym users. Most good gyms will encourage a social side to gym membership. Over the years we've seen many strong friendships and even life partnerships which started in the gym. Studio classes are a great way to work out. They build your confidence and you'll have the supervision of one of our experienced and qualified studio instructors ensuring you get the most from your workout. Most gyms with a class studio will offer a wide range of different classes throughout the week, so you might want to try a few out before deciding which ones are right for you. If you're totally new to the gym, we recommend you check out our instructor-led Kick Starter package. It gives you a month of full membership together with all the support you need to turn you into a confident gym user. So if you've made the decision to get fitter then give yourself the very best chance of suceeding! Have we covered everything? If you've got more questions, then don't hesitate to get in touch. A member of our team will be happy to answer any questions you have.